If you're looking to upgrade your broadband speed and television offering ready for when the family descends for the Christmas holidays, Virgin Media has an almighty Black Friday deal that will likely tick all the right boxes. The fibre internet provider has slashed the price of its flagship Full House bundle, which includes blisteringly fast fibre broadband and free weekend calls to UK landlines, as well as a brand-new TV V6 set-top box with access to 230 channels, including ESPN, Sky Witness, Disney Channel, Discovery, Fox HD, Sky One HD, Cartoon Network, and the entire BT Sport collection in 4K Ultra HD. The Vivid 100 fibre broadband included in the bundle offers average download speeds of around 108Mbps. For context, Netflix recommends 25Mbps speeds to watch its Ultra HD shows and movies in the best possible quality – so there's enough bandwidth with this bundle for the whole house to be streaming 4K simultaneously. Virgin Media is also throwing in its flagship TV V6 set-top box, which has the ability to record six television shows while you're watching a seventh recorded earlier. The TV V6 can store 500 hours of standard definition TV, or 100 hours in HD. The set-top box also supports a number of on-demand apps from the likes of Netflix, YouTube, iPlayer and hayu. And unlike the previous generation TiVo box, there's a dedicated button on the TV V6 that triggers a bleeping noise on the remote so you'll be able to quickly locate it whenever it falls down the back of the sofa. Virgin Media's Full House bundle is on-sale for £45 a month – a saving of £348 over the course of the 12-month contract. This is the lowest-ever price for the flagship Virgin Media TV, Vivid 100 fibre broadband and Talk Weekend bundle. After the first 12-months, should you decide to continue with Virgin Media, the bill will jump to £74 a month. There's also a £25 one-off set-up fee. The Virgin Media Full House bundle comes one day after the latest Black Friday offering from Sky TV has finally sold-out. 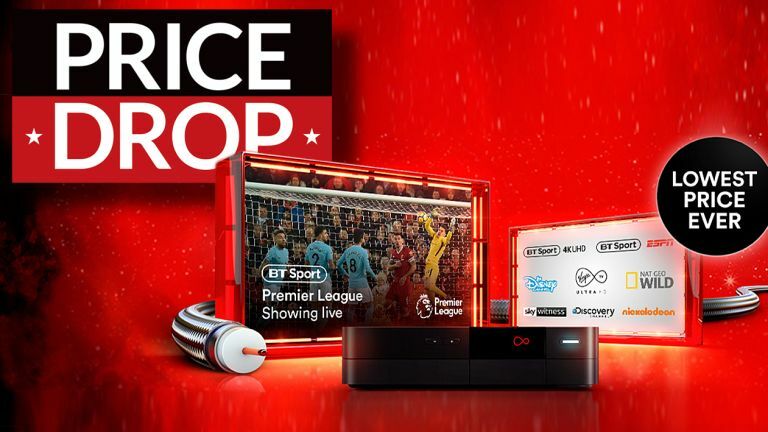 The bundle had offered its flagship 2TB Sky Q box with Sky Cinema HD, Netflix HD subscription, Sky Entertainment, as well as multi-room, and a free 43-inch LG Ultra HD TV for £55 a month. However, it is no longer available – despite Black Friday itself not landing until Friday November 23. Around 60% of the UK households are now able to receive superfast Virgin broadband, but if you're not in a compatible area, why not head to T3's best broadband deals page or use the price comparison chart below to see what alternatives are available to you.